A Blaine County jury found a 27-year-old Hailey man guilty Thursday of aiding and abetting delivery of methamphetamine in a drug sale more than two years ago to a police confidential informant. 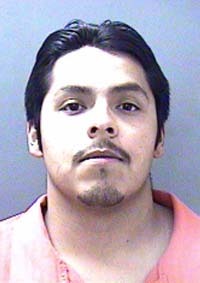 Sentencing for Robert Javier Garcia Jr. was scheduled for Oct. 29 in 5th District Court. The crime is punishable by up to life in prison. Garcia, who had been free on $15,000 bond, was taken into custody at the conclusion of the trial with a new bond set at $40,000. The trial was started Tuesday and the jury began deliberations at about 3 p.m. Wednesday. After meeting for three hours that day, the jury reconvened at 9 a.m. Thursday and delivered its guilty verdict at 10:35 a.m.
Garcia was one of nine people indicted by a Blaine County jury in June 2011 on various felony drug charges. Six other people named in the indictments have earlier been sentenced to prison terms and two suspects remain at large. Garcia himself remained at large until apprehended by U.S. marshals, acting on a Blaine County warrant, in March near Santa Fe, N.M. He was convicted of participating in a methamphetamine sale to a police confidential informant in Blaine County on Aug. 25, 2010. In a case investigated by the Blaine County Narcotics Enforcement Team, the jury determined that Garcia assisted in a drug sale with two other men, Jose Manuel Hurtado-Delatorre, 28, and Ricardo Vargas-Hurtado, 22. After pleading guilty to a single count of delivery of methamphetamine, Hurtado-Delatorre was sentenced in March to four and a half years in prison. Vargas-Hurtado, who pleaded guilty to two counts of aiding and abetting delivery of methamphetamine, was sentenced in March to four and a quarter years in prison. Sentences for both men were determined by District Judge Robert J. Elgee, who is also presiding judge in the Garcia case.